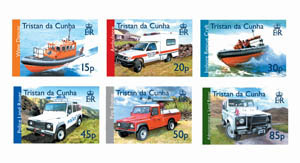 A selection of Tristan da Cunha stamps of no longer available from the Post Office but are of interest to people who wish to know more about the island and its history. 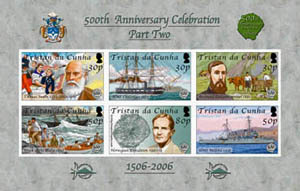 This page reatures stamp issues of local interest that are no longer available for sale from the Tristan Post Office, but are of special interest to philatelists and others with an interest in the island and its history. 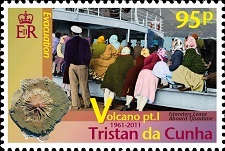 After the death of Sir Ernest Shackleton during his last expedition, his ship the Quest called in at Tristan da Cunha, arriving the 20th May 1922. 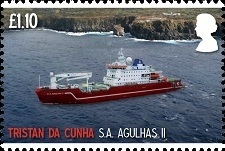 They stayed for five days, undertaking scientific work within the island group, before heading off to Cape Town then homeward to Plymouth. 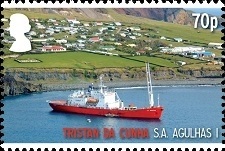 The Agulhas provides a cargo and passenger service to Tristan da Cunha each spring, and exchanges personnel and delivers cargo at the South African Meteorological Station on Gough Island. 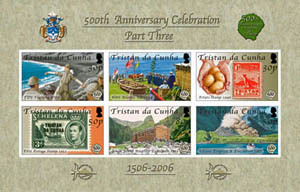 This special issue commemorates Tristan family surnames with stamps representing the nations from whence the original settlers came, illustrated by their national flags and birds native to their home country. 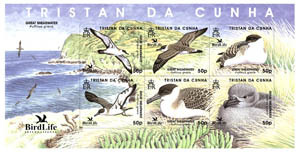 Green, with the Dutch flag and an Oystercatcher Swain with the English St George's flag and an Avocet (used also on the RSPB logo) Hagan / Rogers with the US Stars and Stripes and an American Bald Eagle Repetto / Lavarello with Italian Flag & Hoopoe (emblem of the Italian League for Bird Protection). 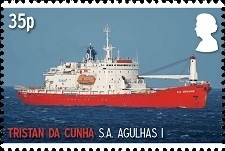 Nine scheduled ships a year bring mail from Cape Town to the world's most remote community. 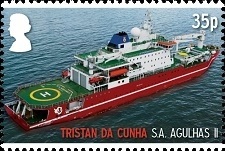 The last 2009 ship leaves Cape Town on 26th November. 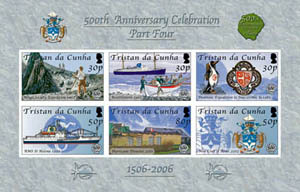 Miss this last post before Christmas and the next post is not due until 3rd March 2010, a gap of three months. 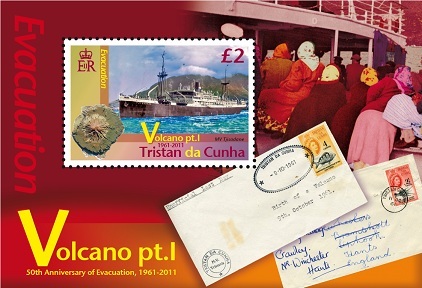 So it is hardly surprising that the arrival of post is an important event on the island. 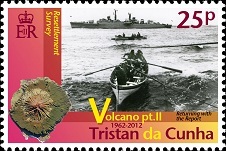 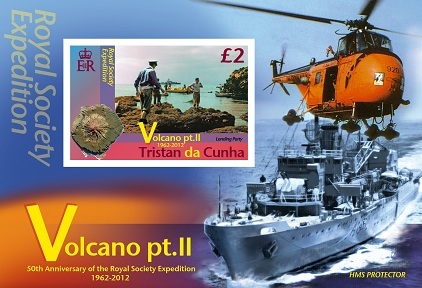 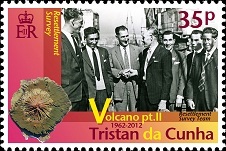 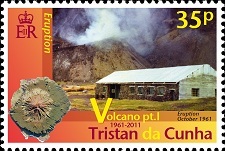 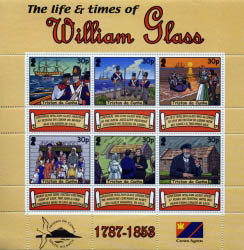 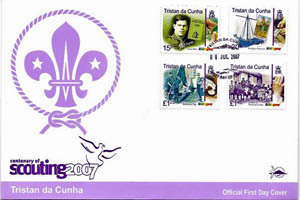 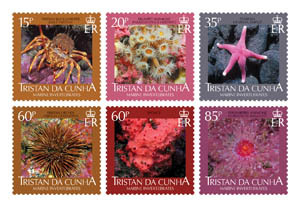 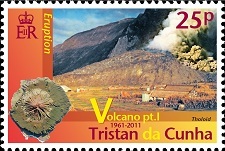 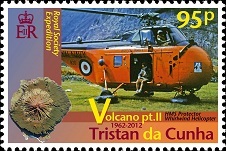 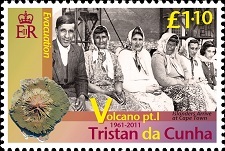 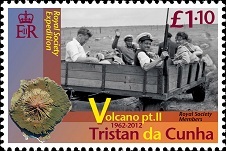 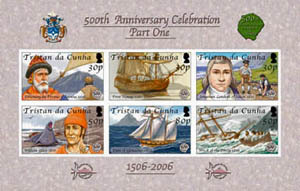 The arrival of the mail is highlighted in this last 2009 stamp issue, and available for order now from the unique Tristan da Cunha Post Office. 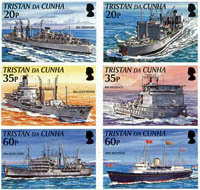 The 50p stamps show paintings by John Batchelor of: Tudor Mary Rose; the tea clipper Cutty Sark; the first HMS Endurance; the 1902 steel hulled 3 masted ship Suomen Joutsen (pictured passing Tristan); the Royal Fleet Auxiliary vessel Lyme Bay which brought Operation Zest to Tristan in 2008, and the cruise ship MS Explorer, which had visited Tristan, but sank after hitting an iceberg in November 2007. 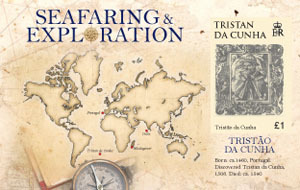 The £1.00 Souvenir Sheet features Tristao da Cunha's voyage in 1506.